Hey everyone. I'm very new to being a member of this forum but have been paying attention to it for quite some time. My question is...what does everyone think is a cool look for a CB750 tailsection. 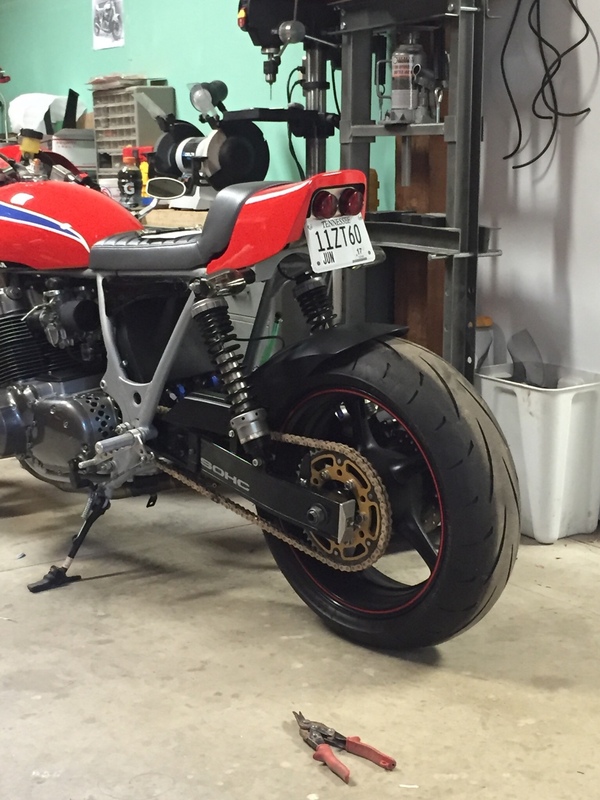 Ive made a lot of progress on my 1980 CB750C but have hit a mental road block on how to design the back end of it. Id really prefer not to just bolt on a premade seat/tailsection that everyone else can also have. any ideas are welcome!!! Gorgeous build so far! I would get on google images and find something you like. Then try and bring that to life. Chances are that even if you copy it, it won't be a direct copy and you'll end up with something unique. See the condensed version of my full build on my blog! Yeah, man. It really is a great build so far. I'd love to see more on what you've done over the course of the build. I say whatever you do, take advantage of the shape of the frame. Instead of bobbing it off like a lot of guys do, use it. It has a good uptick which could lend well with a flare, tail or spoiler-like look. Maybe a slimmed down, street version of a GP style tail. Thanks for your input guys. At first I was worried about the front end conversion, then the monoshock/swingarm conversion, then wiring...got thru all that and the brain shut down. Lol. Heres a few more pics of the progress. Nice work so far. I'm currently working on an 81 cb750c. My state requires fenders front and rear so I'm going with an upswept hoop on the rear and mounting the fender underneath it to maintain clearance. It's still in the works but I'm looking forward to seeing what you come up with. Narrowed Yamaha Seca 550 tail. Nice looking bike! I would say if you're proficient in photoshop you could play with different shapes. Or print a couple of quick color prints and break out some markers and play around until you find the right shape. It's ugly but you get the idea. I'm still trying to figure out how I want to mount my battery and electrics before following through with the fender mounting. Matching the lines of the tank is always a good approach too so you get a seamless transition from front to back. That's amazing. The things you can do with technology. I absolutely love that! neevo I really like this! I'm going try to look into how RB racing made that tailsection. It flows perfectly. Thanks man, just playing around at work. Can't wait to see what you come up with. Another major hurdle handled. Decided to go with an Ebay find for my tailsection. Company called Carbon Moto out of the U.K. had this nice little piece for $100 +$50 for shipping. While it isn't a direct bolt on, it is the exact shape I had in my head. Fits well and will be easy to make a seat pan. Just needs a little structural reinforcing and a solid way to mount it. Also has a nice shape at the rear that will allow for a nice taillight. I used a similar latch to this: but from a GSXR with a slip fit in front, works perfect and pops off fast. the price is high you can find them for way cheaper.